Single cell thunderstorms usually last between 20-30 minutes. A true single cell storm is actually quite rare because often the gust front of one cell triggers the growth of another. Most single cell storms are not usually severe. However, it is possible for a single cell storm to produce a brief severe weather event.  When this happens, it is called a pulse severe storm. Their updrafts and downdrafts are slightly stronger, and typically produce hail that barely reaches severe limits and/or brief microbursts (a strong downdraft of air that hits the ground and spreads out). Brief heavy rainfall and occasionally a weak tornado are possible. Though pulse severe storms tend to form in more unstable environments than a non-severe single cell storm, they are usually poorly organized and seem to occur at random times and locations, making them difficult to forecast. The multicell cluster is the most common type of thunderstorm. The multicell cluster consists of a group of cells, moving along as one unit, with each cell in a different phase of the thunderstorm life cycle. Mature cells are usually found at the center of the cluster with dissipating cells at the downwind edge of the cluster. Multicell Cluster storms can produce moderate size hail, flash floods and weak tornadoes. Each cell in a multicell cluster lasts only about 20 minutes; the multicell cluster itself may persist for several hours. This type of storm is usually more intense than a single cell storm, but is much weaker than a supercell storm. The multicell line storm, or squall line, consists of a long line of storms with a continuous well-developed gust front at the leading edge of the line. The line of storms can be solid, or there can be gaps and breaks in the line. Squall lines can produce hail up to golf-ball size, heavy rainfall, and weak tornadoes, but they are best known as the producers of strong downdrafts. Occasionally, a strong downburst will accelerate a portion of the squall line ahead of the rest of the line. This produces what is called a bow echo. Bow echoes can develop with isolated cells as well as squall lines. Bow echoes are easily detected on radar but are difficult to observe visually. The supercell is a highly organized thunderstorm. Supercells are rare, but pose a high threat to life and property. A supercell is similar to the single-cell storm because they both have one main updraft. The difference in the updraft of a supercell is that the updraft is extremely strong, reaching estimated speeds of 150-175 miles per hour. The main characteristic which sets the supercell apart from the other thunderstorm types is the presence of rotation. 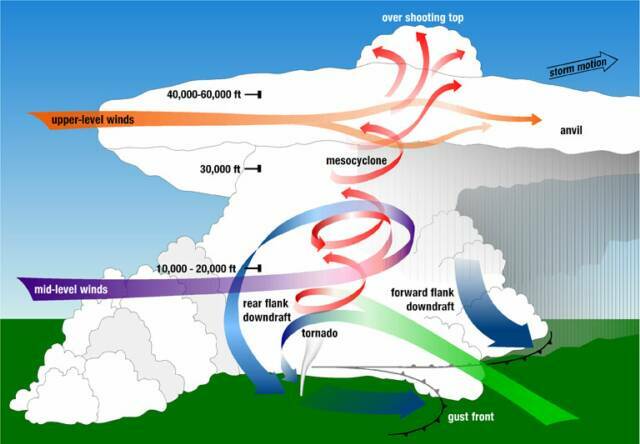 The rotating updraft of a supercell (called a mesocyclone when visible on radar) helps the supercell to produce extreme severe weather events, such as giant hail (more than 2 inches in diameter, strong downbursts of 80 miles an hour or more, and strong to violent tornadoes. A schematic of a supercell thunderstorm showing the location of the mesocyclone, the updraft and downdrafts, and the steering winds. strong upper-level winds blow the precipitation downwind. 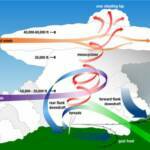 Hardly any precipitation falls back down through the updraft, so the storm can survive for long periods of time. The leading edge of the precipitation from a supercell is usually light rain. Heavier rain falls closer to the updraft with torrential rain and/or large hail immediately north and east of the main updraft. The area near the main updraft (typically towards the rear of the storm) is the preferred area for severe weather formation.